McDonald&apos;s is the world&apos;s largest chain of hamburger fast-food restaurants across 119 countries. McDonald&apos;s primarily sells Burgers, cheeseburgers, chicken, french fries, breakfast items, soft drinks, milkshakes and desserts. In response to changing consumer tastes, the company has expanded its menu to include salads, fish, wraps, smoothies, fruit and seasoned friesMcDonald&apos;s India ensures that the highest level of food safety standards to be consistently maintained across all the restaurants. McD India serves to many cities like Hyderabad, Bangalore, Mumbai, Ahmedabad, Delhi, Chennai and lot more. Get free exciting toys through the Happy meal you order.Explore the Breakfast menu and also get discounts on French fries. Feast yourself with the World&apos;s best class food with reasonable prices by using the Coupon codes and Best Deals give below. Experience the true taste of food with the McDonalds!! Buy 2 rice bowls and get Mcchicken or McVeggie and coke absolutely free. Offer valid for all users. Use the coupon code and get the offer soon. Hurry up!! Fulfill your hunger at the best prices and savings!! Buy the rice bowl and get a drink free. Offer valid for all users. Use the coupon code to avail the offer. Offer valid once per user. Hurry up!! Grab the offer soon. Special offer for repeated users!! Get any regular burger meal absolutely free with the purchase of worth Rs.450 and above. The minimum order value is Rs.450. Coupon valid once per user. Order today!! Order the tastiest and delicious food at McDonald&apos;s!! Order for the food worth Rs.199 and get a free Mexican aloo or McEgg burger absolutely free. Minimum purchase value is Rs.199. Offer valid for all users. Use the code and avail the offer. Hurry up!! Enjoy it today. 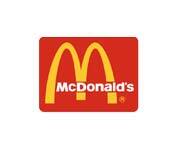 Enjoy your favorite foods at Mcdonalds at the best prices ever!! Order food worth Rs.275 or more and get free McChicken or McVeggie absolutely free. The minimum order value is Rs.275. Offer valid for all users. Coupon code valid once per user. Hurry up!! Feeling hungry!! Special offer for all users. Purchase any medium or large meal and enjoy the free McFlurry. Applicable locations are Ahmedabad, Anand, Baroda, Bengaluru, Chennai, Hyderabad, Indore, Mangaluru, Mumbai, Mysore, Nashik, Pune, Rajkot, Surat, Vapi. Use the code at checkout and avail the offer soon. Try something new every day at Mcdonalds!! Get free McChicken or McVeggie with the regular coke. Order value must be worth Rs.279 and above. Offer valid for all users and only once per user. Do not miss this delicious deal. Hurry up!! Grab the offer now. On minimum orders of Rs.375 get McChicken/McVeggie with Regular Coke free. Hurry Up!! Use this coupon code and get Free Saucy Wrap, McAloo, McEgg At deal Price Of Rs.199. Hurry Up!! Use Amazon pay wallet for the transaction of order at Mcdonald&apos;s and get 50% cashback. Maximum cashback Rs.100. Valid once per user. Order your favorite meals, desserts and more from Mcdonalds and get 25% cashback by using Freecharge wallet for the transaction. Maximum cashback Rs.50. On minimum orders of Rs.350 above get Rs.60 cashback Paytm cash. Make transaction through Paytm. Maximum cashback Rs.60. On minimum orders of Rs.275 get a Get Free McChicken/McVeggie With Coke. Use coupon code on the checkout page to get this offer. On orders of Rs.625 above get 2 Burgers free. Use this coupon code on the checkout page to get this free offer.